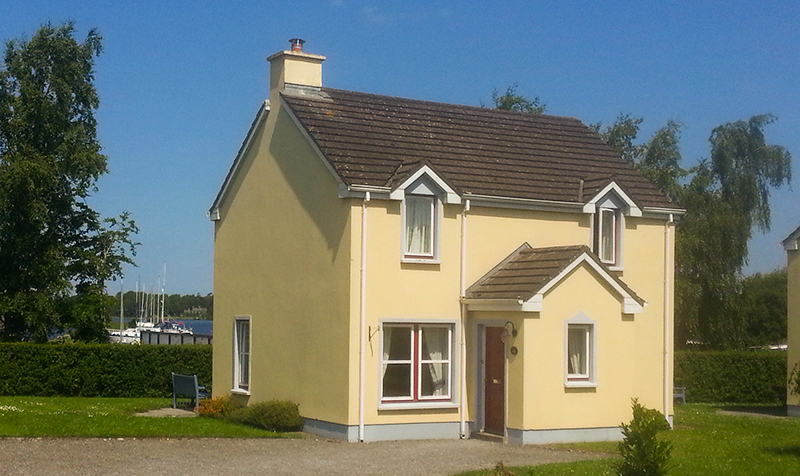 Waterside Cottages are situated on the shores of Lough Derg in the friendly harbour village of Dromineer, Co Tipperary. These 11 self-catering holiday houses have beautifully maintained gardens and also a tennis court on site. Ideally located with easy access to Dublin, Shannon and Cork, Waterside Cottages offers 11 four-star self-catering holiday properties on the shores of Lough Derg, Co Tipperary. All of the cottages are identical in layout and accommodation. Each has three bedrooms and accommodates six people. The master double bedroom has an en-suite bathroom, two twin bedrooms (one on the ground floor) and a fully fitted bathroom. All linen and towels are supplied. There is also a hairdryer, TV and payphone. There is a large living room with a separate kitchen and dining area. The kitchen comes fully equipped with an electric cooker, dishwasher, fridge, coffee maker and microwave. Set in their own private grounds and with an on-site tennis court, these homes are ideal for family or group holidays. The cottages are laid out around a central play area with ample room for both parking and enjoying the grounds. BBQ facilities are available for guests. These cottages are located at the heart of the welcoming harbour village of Dromineer and are within easy walking distance of all amenities like shops, pubs and restaurants. The lake is right beside the cottages with Lough Derg Yacht Club the second oldest yacht club in Ireland on your doorstep. Nearby activities include a choice of water sports, golf, paintballing, go-karting, horse riding, walking, cycling and fishing. In fact, fishermen and women will be able to avail of bait fridges and a tackle room. There are also many attractions that visitors will enjoy like the holy island of Iniscealtra, Redwood Castle which is home to St. Kieran’s Well, 16th-century Lackeen Castle and the monastic settlement and Garrykennedy Castle. And thats to name but a few!